I generally don't like gold, but I do love this color! It's flaky, so you need to layer it a few times to get it anywhere near solid. I layered it here over Sally Hansen Gilty Pleasure (the old square bottle. I love those. They need to bring those back.) I think layering this flakey glitter over a similar color makes it look like brass. I actually enjoyed wearing gold polish. I did not, however, enjoy taking this stuff off. It comes off like any other glitter...which means that without foil, it gets everwhere. Love this color! It is on my wish list! it is definitely worth picking up. I really like how a few coats over another gold ended up looking like brass. And a single coat looks like all those fancy gold leaf polishes. ....if you can find it. It was a Target exclusive Fall LE. 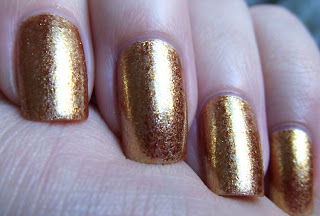 OPI Goldeneye is a dupe though. It's also similar to L'Oreal Amazon's Flash and Wet n Wild The Gold & The Beautiful or Sinful Colors All About You. The Elmer's base coat trick is basically magic. Elmer's, base coat, glitter/etc, top coat = Magic Peel-Off Glitter. Soooo worth it. 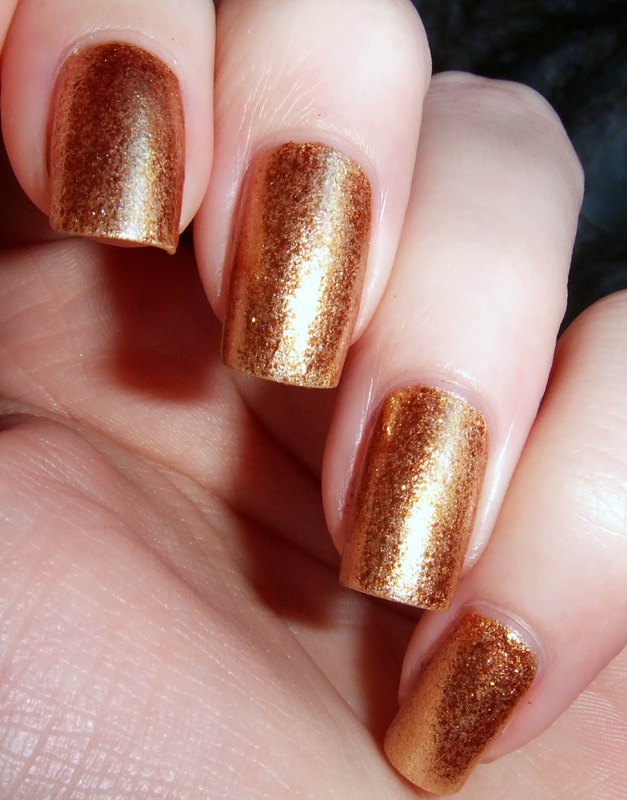 I tried it once, but I was impatient and didn't let the polish dry all the way. I really need to give it another go. I tried it once and it roughed my nails up so badly on the first nail that I used acetone on the rest. It seems to vary drastically with body chemistry. Some it works just fine, some it pops off in sheets the next day, and some it will not peel off without taking strips of the nail with it.